Replacement refs: The NFL does not care if games are unwatchable. The NFL does not care if games are unwatchable. 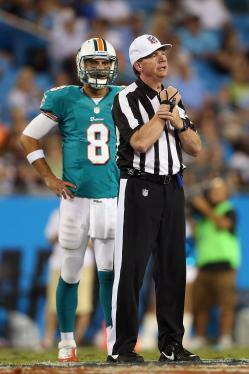 Matt Moore of the Miami Dolphins watches as replacement ref David Scott calls a holding penalty. Photo by Streeter Lecka/Getty Images. Oh, yes, those officiating conferences. The most damning thing about the scab-ref video Craggs was discussing isn’t any of the bumbling or the stammering. It’s the lower right-hand corner, where the timer pitilessly counts up to 1:04 (or 1:05, depending on your player). That’s more than a minute of game broadcast time—of life—annihilated. For the sake of a punt play in an exhibition game where neither team managed a touchdown. And this is an edited clip! I don’t have the stomach to dig up a full version and pull out a stopwatch. I’m not sure how much I blame the scabs for wasting time, though. Don King and company may not know the NFL rulebook—or the finer points of spotting the ball, or how to speak in complete sentences—but on this one point, they’re totally up to league standards: The NFL does not care if games are unwatchable. King’s performance punctuated an exhibition game in which the Patriots and Giants spent three hours scoring 9 points between them. Last night in Toronto, the Baltimore Orioles scored 12 runs on 18 hits and still finished their game in 2:48. Baseball is supposed to be football’s tedious elderly cousin, but it seems almost spry by comparison. True, the NFL’s time-wasting is usually in the name of getting calls pedantically correct, rather than allowing the refs to build a Jenga tower of errors upon errors. But either way, you’re sitting there watching a bunch of guys in stripes cluster together and debate and Zapruderize the action on video, rather than watching any new football action. Or you’re watching commercials. The replacement referees are merely the latest demonstration of the NFL’s complete contempt for its viewers. If the league cared about the quality of its product, it wouldn’t be locking out the regular officials—it would be tripling their pay and making them full-time employees. All they’re responsible for is the pace, flow, and integrity of the game. No reason for the owners to spend money on that, not when they can spend it on monster video boards, so fans can watch two-story-tall refs dithering in HD. This is the league of Mike Brown and Bill Bidwill: stingy, selfish, and content with mediocrity. Hey, we’re the biggest and most popular sport in America—what are you gonna do, not watch it? Shut up and wait for the scab refs to walk off the eight-yard penalty. Or, if you have better things to do with your time, you can send the league $69.99 for a subscription to NFL Game Rewind. There, in tacit admission of what’s wrong with the regular broadcasts, the NFL will supply you with condensed version of games, or the power to fast-forward through the dull parts yourself, or access to the fabled all-22 footage, with its revolutionary promise to actually let you see what the players are doing. The National Football League: where watching football is a premium add-on. I wonder if they’re giving the scab refs a complimentary subscription?